Thompson leads the way for the White House among GOP activists in Wisconsin, but it&apos;s not Tommy. The annual WisPolitics.com straw poll puts U.S. 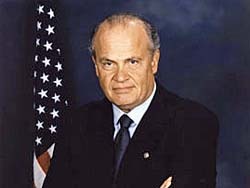 Senator Fred Thompson as the party favorite for president in 2008, but he&apos;s not even officially a candidate yet. UW Political Scientist Charles Franklin says Thompson is a solid conservative and generally likeable. "I think Fred Thompson is benefiting a lot from being the alternative to the other candidates." Franklin says the top three Republican presidential candidates in the national polls — Rudy Giuliani , Mitt Romney and John McCain — each have something about them which does not appeal to the mainstream conservatives. Fred Thompson represents an alternative to the status quo, he says, and, although Thompson is probably most well-known for his role on TV&apos;s " Law and Order ," Franklin says voters in this straw poll are well-informed and likely did not vote for Thompson based on his celebrity. Franklin also notes, there&apos;s no longer an obligation to support the hometown guy, so Tommy (Thompson) is not a shoo-in for the Badger state. "I think that the days of a favorite son candidacy have substantially waned." Franklin says there was a time when a state party would always line up behind the governor or former governor, but that&apos;s not necessarily the case these days. Still, it&apos;s too early to make any presidential predictions. The WisPolitics annual straw poll was taken at the state Republican Party convention over the weekend. Out of 306 total ballots cast, Fred Thompson received 95 votes, while former Governor Tommy Thompson got 84 votes.